First, I'm not a gunsmith, an engineer or a physicist, just your average Joe. Responses are welcomed. For years, I didn't know much about recoil springs nor did I care. Whatever was in the pistol, I shot with it and couldn't care less. After a few years, my load of 4.0 BE with a 185gr hpswc started to seem a little hot during sustained fire. 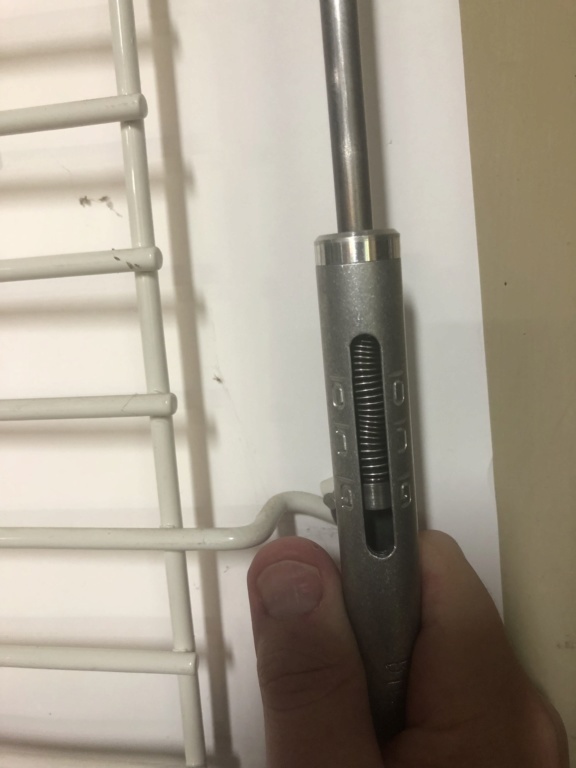 I had bought a pack of recoil springs many years ago so I thought I would increase the weight but I didn't know what was exactly in the pistol. By trial and error, I thought I found a good replacement and it functioned well at my range. However, during the first competition with this spring at the Bob Chow Memorial Match in the Chilly San Francisco summer morning weather, the pistol would not function. Tough lesson learned. There was recent talk in the forum about reduced loads for sustained fire, as low as 3.4BE with a 10 lb. recoil spring. With my pistol, the 200gr SWC worked most of the time but not the 185gr hpswc in colder temperatures. My problem also was that many years ago, a trusted gunsmith had measured all my recoil springs and found that they did not always measured to what was labelled. After much testing, I know what loads would work with the present recoil spring and under what temperatures. 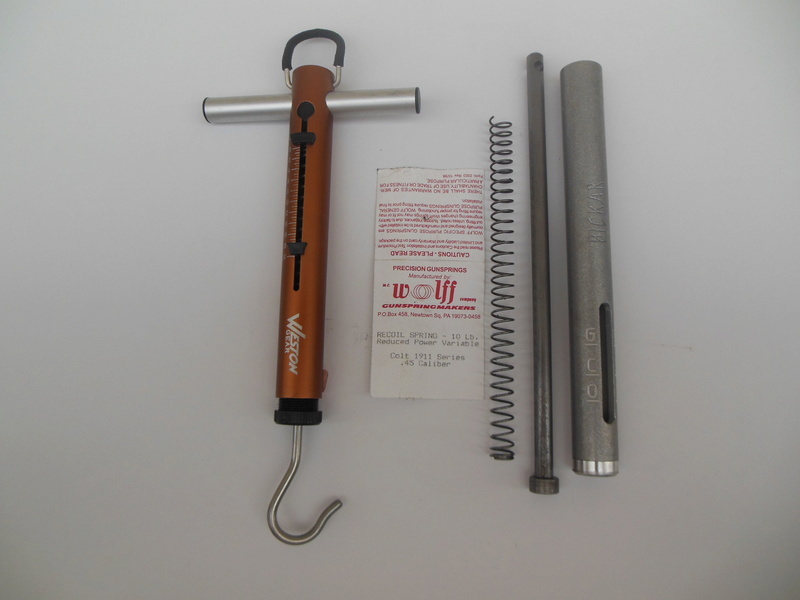 Thanks to a friend who loaned me a recoil spring tester pictured above, I was able to repeatedly measure my springs. I found that with usage, the measured spring weights went down. This was what most likely happened to what I described above which over time, the felt recoil increased. That spring now measured only 9 pounds. The 16.5 lb. spring which I never used weighed 18 lbs 10 years ago and is still the same. The recoil spring in the (loose) pistol that I shot 10,000 rounds of hardball when in the Navy was only 12 pounds. There were a couple of take home techniques using the recoil spring tester. Before starting, I had checked the calibration on the scale using various dumbbell weights. The rod and the housing cap of the tube needed to be well lubricated otherwise I had some false higher readings due to the metal binding. The end cap of the housing started to back out with repeated testing so this must be checked to be tight. Instead of holding the scale by hand, the scale worked best when the scale was secured using the ring. The spring is not fully compressed, pull only to the lined marking. During a past pistol clinic at one of my clubs, the NRA national junior coach Eric Pueppke, mentioned about checking recoil springs from time to time and replace as needed. There appears to be more about recoil springs than I original knew. I think there's a little bit of black magic in this whole recoil spring weights business. I have a number of calibration packs from Wolf, Wilson Combat and others, and they are not the same at all. One of my .45 gun won't cycle reliably with 10 lbs Wolff spring, but the very same gun and the very same load works just fine with the 10 lbs Wilson Combat spring. When I tried the same spring, same ammo and even the same magazine in one of my other guns, it won't work. I think it's a combination of many many factors. BTW, both springs measured as 13 lbs on my spring tester. I guess the best strategy would be to obtain a number of calibration packs in the 9 lbs to 16 lbs range, take your gun and your standard load, start with the lightest spring and work your way up until the gun stops cycling reliably. Then maybe clip a couple of coils off the heaviest spring that is still working. During my Apprenticeship, I spent time on the "Spring Bench". Using the Military drawing for a 1911 spring, the spring calculator software deemed the spring "over-stressed", try again. Well, we wound one based on the drawing and the first time through the spring load tester, the spring shrank in length considerably. None of the drawing load specs could be met. Further reading of some Spring Engineering books led us to a discussion of "pre-stressing". This is where the spring is deliberately wound longer than specification, tempered, and compressed to bottoming out. Upon removing the load, the spring now measured as the drawing specs, with regards to free length. Also, the loads at compressed height also matched the drawing. Fortunately, I had a brand new Colt manufactured spring and it too matched the drawing specifications. The spring is still "over-stressed" and will continue to weaken/shorten with cycle time. A good reason to check your equipment on a regular basis and replace the spring as needed. PS there are several on-line spring calculators on the Internet for those that have a desire to learn more. You also need to know the compressed load length that you need for the weight spring. It's not fully compressed. Something like 1.6"
Nice info, hey xmaster where and when is the Bob Chow Memorial Match held? troystaten wrote: Nice info, hey xmaster where and when is the Bob Chow Memorial Match held? The match is held mid-June at the San Francisco Police Range by Lake Merced near the ocean, where Mark Twain correctly described the coldest winter he experienced was summer in San Francisco. This range has the fastest turning targets for sustained fire I've ever seen, a quick snap bang when the targets turn. No chance for late skidders. I shot my first match in 2003 when I met Bob Chow at the age of 95. He still had fire in his eyes whenever he talked about shooting. Sadly, he passed 4 months later before I got to know him. I've been told he amassed thousands of medals throughout his shooting career. 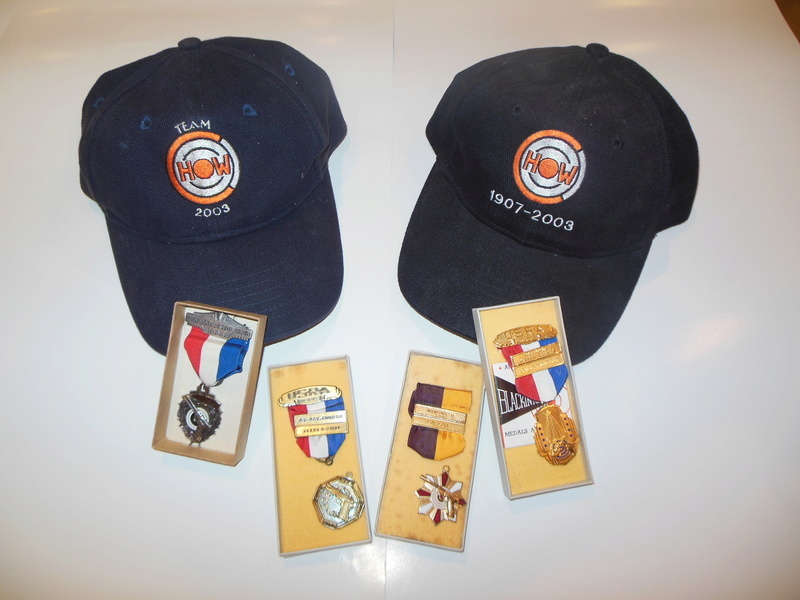 Pictured above are a few which were given to participants of his Invitational Bob Chow Memorial Team Trophy Match. Starting from the left, the first three were dated 1954, 1959 and 1961 respectively. It's a team match consisting of a master, expert, sharpshooter and a marksman. Individuals without a team will be able to shoot with formation of last minute teams by the match director. There are about 30 firing points with 2 relays. This annual match had been cancelled the last two years but there's hope for it to return next year. Yes, that friend was JB. Enlarge the picture and note the Bickar etching on the housing. With the way he's shooting nowadays, he shouldn't care about his recoil springs, and he doesn't. Again, thanks again for the use of the spring tester. It's a good starting point to relatively compare one spring to another when testing loads, and to evaluate a spring when it needs replacing. Thanks Xmaster, I will keep an eye out for next years match if it happens. I have a model 17 that Bob Chow did an action job for me in 1984, Bob was a really nice gentleman. Steve Reiter has shot in the Bob Chow Memorial Match also. Built like a tank! My 1970s coach and mentor LtC Miller shot in the 50s and did cross paths with Bob Chow. As a coach LtC Miller said Bob Chow guns were the one to have back then. I recall Coach speaking well of Bob Chow and Joe Benner. xmastershooter wrote: The spring is not fully compressed, pull only to the lined marking. Those aluminum spring testers need to be polished big time inside as well as the rod and components. Mine was all over the place until I tuned it up.